Maya Avis is a doctoral candidate in Anthropology and Sociology of Development at the Graduate Institute, Geneva. She specialises in legal anthropology, focusing primarily on the Naqab-Negev region of southern Israel. 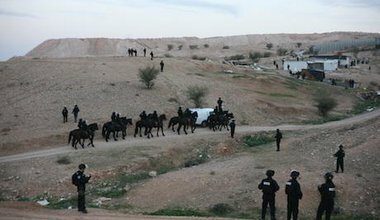 An eye-witness account of the violent demolition of the Palestinian-Bedouin village of Umm al-Hiran by the Israeli state to replace it with a Jewish village.